Manufactured by Cougar. Releasing in Q1, 2016. Works on Windows and Mac OSX. Review unit provided by manufacturer. Cougar is a relatively unknown player in the PC gaming hardware space that's been making efforts to expand its reach, while competing against giants like Corsair and Razer. The German company originally made cases and power supplies (and it still does) and recently branched out into the field of gaming peripherals with the introduction of mechanical keyboards and gaming mice. 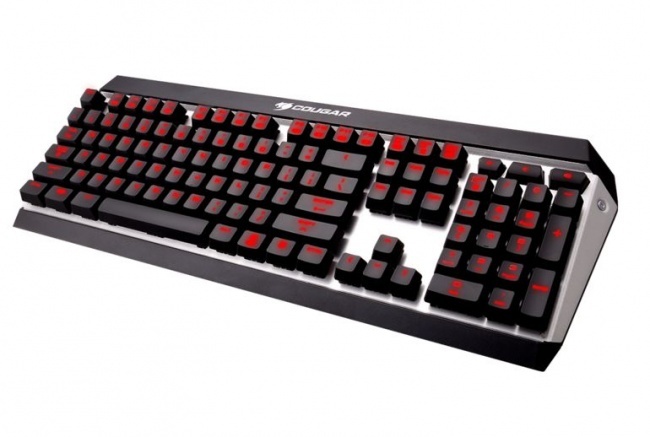 The company's latest kit is the Cougar Attack X3, a mechanical keyboard designed for gaming. Retailing at $99, I was really excited to see what they had to offer and how it would compare with the other keyboards I've used. First impressions are important, and I liked the look of the keyboard immediately. 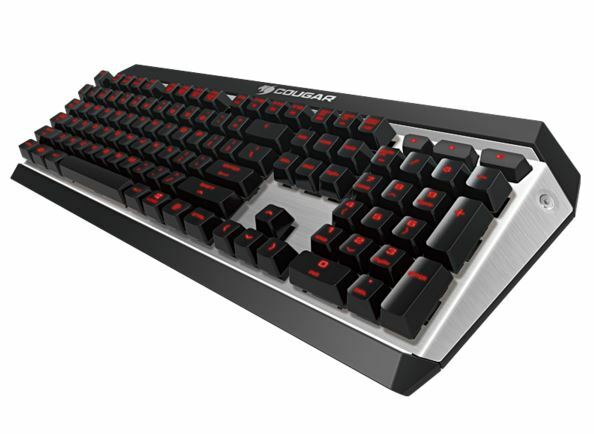 The keyboard rocks a utilitarian design compared to some of its competitors in the gaming market, intended to provide the essentials with just a few bells and whistles. It's nothing over the top, but it's no slouch in terms of aesthetics, either. The keyboard has an unconventional, futuristic look, sporting a brushed aluminum frame with elevated keys with large, semi-transparent font. I like the way it looks, especially when it's on. The keyboard has red backlighting with a glow accentuated by the metal surface of the frame. The design is sleek, especially for a gaming keyboard. It doesn't look gaudy. Cougar opted to use high quality Cherry MX switches made in Germany and not cheaper, derivative Chinese MX-mount switches from Kailh (used in Razer mechanical keyboards) and Gateron and other off-brands. The difference between the switches is largely the feel, and most mechanical keyboard enthusiasts--myself included--swear by Cherry MX. The switches have a tolerance of up to 50 million keystrokes, so the keyboard can definitely withstand ample amounts of use. The unit Cougar provided uses Cherry MX Blue switches, which are designed to be tactile as well as "clicky," meaning the stems on the switches have a tactile bump that you can feel when you type, and emit a satisfying "clicky" sound. This differs from other switches, which may feel linear or make little audible chatter. I own other mechanical keyboards that rock different Cherry MX switches (Brown, Red, and Black) and my experience with the Blues on this one felt vastly different, but it didn't take long for me to get used to the sound and feel of the keys. I test-drove the keyboard in Counter-Strike: GO, Warhammer Vermintide and League of Legends for long sessions and didn't once come away fatigued. The keyboard was very pleasant to type on and game with. In terms of performance, the N-Key rollover allowed me to press multiple keys at the same time without causing the keyboard to jam, as cheap $10 Dell keyboards are prone to do. Unlike some earlier mechanical keyboards, you can plug it directly into a USB port and not have to worry about dealing with the old PS/2 ports that some new systems don't even have to get the most out of it. Some of the cheap keyboards you can buy off the shelf at Wal-Mart have problems with latency, which is something Cougar addresses in the Attack X3. In my experience, the X3 never lagged and my keystrokes registered immediately. If there was any latency, it wasn't anything I could notice. The keyboard offers media keys to control your monitor brightness, volume and music. It also sees additional functionality in polling rate keys, which I kept at the default settings. Beyond the hardware, Cougar has a software suite called Cougar UIX that lets you further tweak the keyboard by changing the backlight brightness and program macro keys, which can be useful for programming and even some games. For the most part, I didn't find much use in the software and uninstalled it after a few days. The keyboard works fine without it. Bottom Line: In my weeks of experience with the keyboard, I can say that the Cougar Attack X3 performs well, and like other mechanical keyboards, offers a typing experience above and beyond anything you'd get from a membrane or rubber-dome keyboard. Recommendation: If you're invested in PC gaming, you can't really go wrong with the Cougar Attack X3. It's pleasant to look at, sturdy, and it uses high quality parts. If that's your criteria, go for it.